Some wild animals can be cute, at least at a distance, under controlled conditions, or perhaps just when they are juveniles. Most wild animals, however, demonstrate at some moment that they are wild by acting aggressively, or by feeling depressed or stressed in conditions of confinement. The cuteness and uniqueness of an exotic animal can seduce the most logical of people into thinking that they can provide adequate conditions to a wild animal so that it will actually be happy and willing to act like a domesticated animal, by showing attachment, obeying commands, and generally acting in a safe manner. An entire genre of movies has recently emerged, showing wild animals acting in human-like ways, sometimes in Happy Feet-style fantasies. A common theme among them is the connection between humans and the animals. The wildness of the animals is almost always conquered by the goodness of people. The best term for this sentiment is hubris. 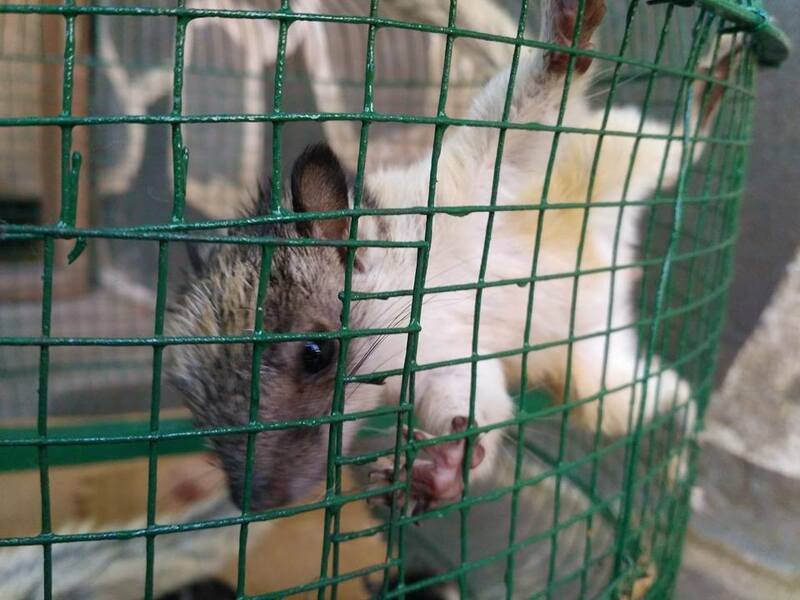 One of several variegated squirrels taken from the pet trade and brought to Estacion Biologica Laguna de Apoyo to transition back to the wild. Photo Andras Dorgai. This hubris is multiplied when a poor animal is placed for sale at a street light in Managua. So often, we see wild animals such as parrots, toucans, monkeys and even an occasional feline for sale, all bidding to enchant someone enough to plop down a little money and take the animal home to convert it into a family pet. Purchasing wild animals as pets presents a terrible threat to the populations of animals in the wild. Captures of wild animals for use as pets have decimated the populations of animals such as Scarlet Macaw and the white-faced capuchin monkey in almost all areas throughout the country. Once wild animals have been made into pets, they may face a difficult transition back into the wild. Photo Jeffrey McCrary. But the impacts humans have over wild animals because of the pet trade does not stop with the placement of animals who were once wild into cages and forcing them to live in captivity. The habitats where these animals lived is often ravaged to get the animals out. Fire is an effective hunting technique, driving animals from holes in the ground or in large trees. These sites as effective refugia for wild animals are lost, and often, the fires rage onward because the hunters rarely make special efforts to put out the fires they started. Juvenile squirrels sleep as much as twenty hours per day, in confined spaces in nests, which can be imitated by a bundle of cloths. Photo Jeffrey McCrary. We do get a particular pleasure from the rehabilitation of variegated squirrels (Sciurus variegatoides). Baby squirrels are often captured by animal traffickers by knocking down nests from the tops of trees, and picking up the baby squirrels that survive the fall. The adults, strong and hostile with sharp teeth, are much less interesting as potential pets than the docile and dependent babies. Once in our hands, they must be handled to give the animals the social interactions they need and to assure that they are feeding well and getting sufficient stimulation and exercise. Squirrels adapted to humans may even prefer to climb on them over scaling trees. Photo Jeffrey McCrary. Little by little, squirrels can be reacquainted with their natural habitats. 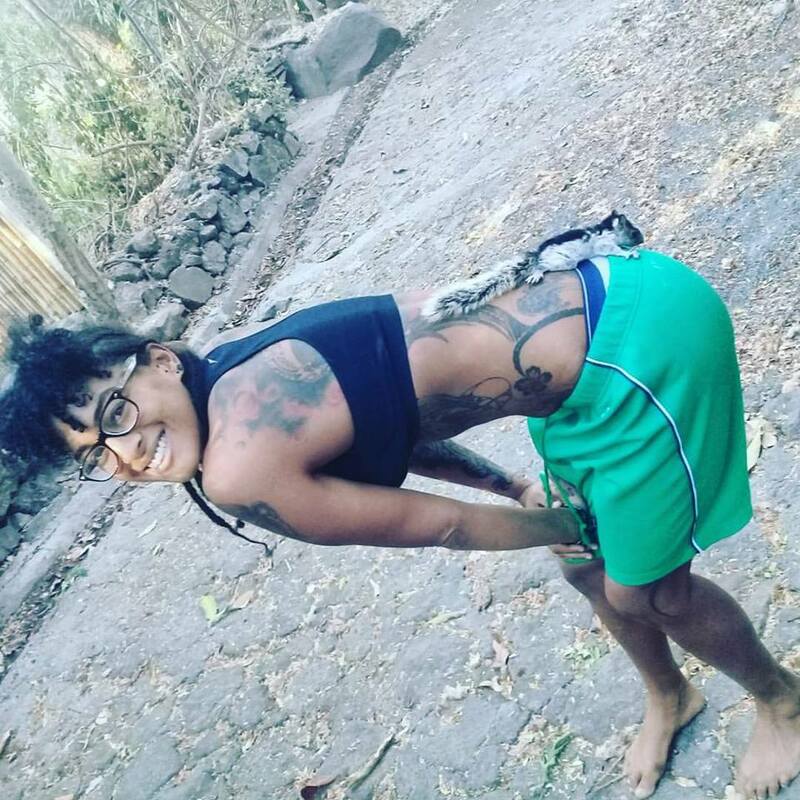 This species of squirrel rarely comes to the ground, finding plenty of bark, small insects and other fauna, fruits and nuts, year-round, high in trees. 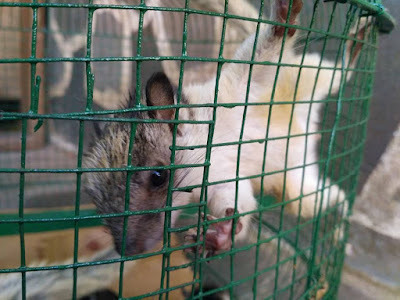 By coming and going from the security of a well-equipped cage, with a door open, the squirrels can choose to sleep, play, feed, and so on, all through the day. Juvenile squirrels can develop their interest in these foods and habitats little by little, until they may lose their interest in humans entirely. Whenever safe to do so, juvenile squirrels are allowed to enter and leave their cage at will, so they can get exercise, explore, and socialize with wild squirrels nearby. Photo Jeffrey McCrary. Whenever squirrels or other wildlife have lost their fear of humans, the dangers they face are abundant. First, they may wander into the hands of people who will capture them all over again and carry them back into the pet trade. Second, they face dangers from domestic animals, cars, and even the risk of being stepped upon can be high. Third, pets may also carry viruses that can affect them. Squirrels quickly learn whose hand does the feeding. Photo Jeffrey McCrary. Once a squirrel has become accustomed to humans, it must learn to find food, socialize with wild squirrels, and stay away from danger. Perhaps the single most difficult barrier to returning to the wild, however, is to have a shelter in which to sleep. Young squirrels may make a shelter on their own, without the help of other squirrels, or they may be allowed to enter into the nests made by other squirrels. 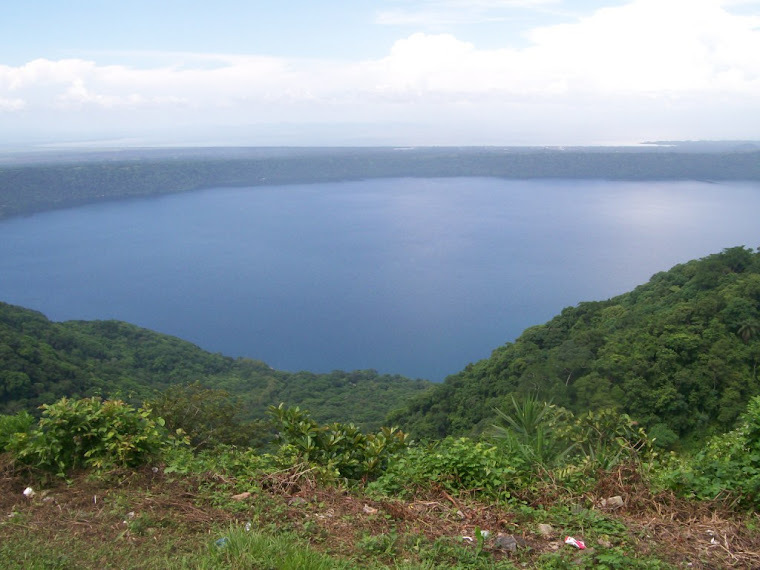 Even though Laguna de Apoyo Nature Reserve is a protected area with priority given to native species, cats abound in properties controlled by foreigners. 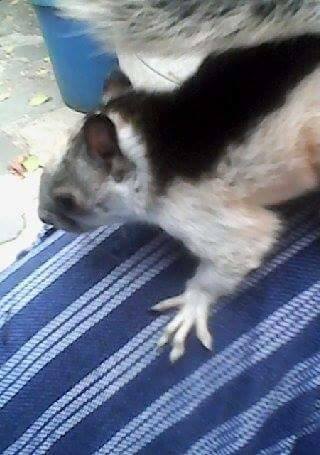 This squirrel, once free and living in the trees above us, was caught by a cat from The Peace Project, and did not survive its wounds. Photo Jeffrey McCrary. Sometimes, a wild animal is successfully reintroduced into the wild. Squirrels will sometimes survive, and their wild character may return, and they may reintegrate into the community of squirrels in the area. When this happens we are always grateful for all the efforts of so many people who participated in bringing food, spending time to provide care, clean cages, and even provide logistics. Each successful reintroduction into the wild results as the culmination of the efforts of many people. Socialization from humans may substitute for the relationships lost from the members of their species for social animals such as squirrels. Eventually, however, they must develop relationships with their own species in the wild setting, to prosper in the wild. Photo Jeffrey McCrary. These squirrels are beginning to learn to spend their days foraging in trees. 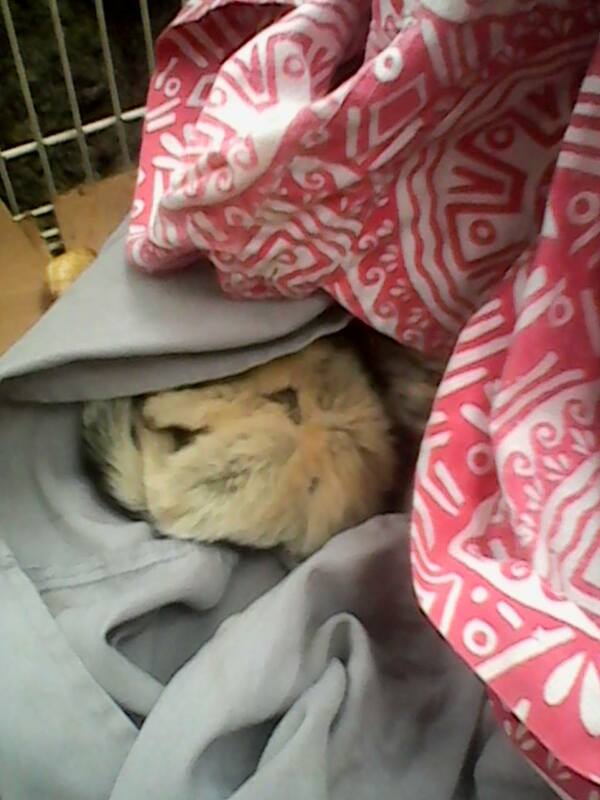 They are still returning each night to sleep in their cage. Photo Jeffrey McCrary. Variegated squirrels may lose their fear of humans after being caught, so that they may actually prefer to be with people to spending their days in the trees. But little by little, with encouragement, they learn skills for feeding and socialization in their arboreal environment, eventually to never return. Photo Jeffrey McCrary. Would you like to help us rescue and rehabilitate wild animals in Nicaragua? Please contact us to find out how you can help by donating food, a cage, or by giving your time as a volunteer.